"The Genius of Manick Sorcar"
Manick Sorcar was the subject for a 2001 Fall Quarter graduate level class project for the Mass Communications program at the prestigious University of Denver, Colorado, USA, where a group of students of Film Making were instructed to "shoot a celebrity, interview the person covering some of his work, edit it, and present it as a two minute interview package to be telecast on campus TV ". The students selected Manick Sorcar as their subject and came to his residence with their sophisticated camera, lights, and script on October 26, 5 pm. 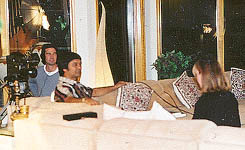 Jack Ferguson was the director and cameraman, Roma Sur was the producer and scriptwriter, and Faye Allen was the interviewer. 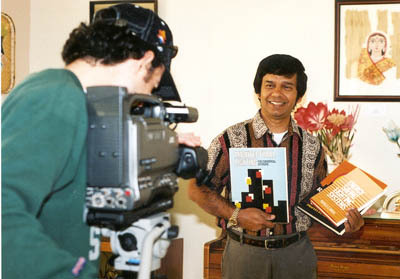 In addition to a thorough and most interesting interview with Manick Sorcar, the group took footage of his technical books , the unique house, the basement animation studio, glimpses of how he does his animation, his awards and trophies, and of the many unique multi-media art pieces displayed throughout the interior. President Lincoln on a grain of rice. "Attempting to capture the essence of Manick Sorcar in two minutes seems an impossible task. For us (University of Denver graduate students Roma Sur and Jack Ferguson along with undergraduate Faye Allen) this was the assignment for the video production class of Dr. Sheila Schrouder. Manick Sorcar is like a Dr. Jeckyll and Mr. Hyde type of character. By day he toils away as an electrical engineer, lighting expert & CEO of Sorcar Engineering, Inc., doing lighting designs for multi million dollar projects such as the Denver International Airport and the Colorado Convention Center expansion. His books (he's written three so far) on lighting engineering serve as text at some of the world's most prestigious universities. While this sounds like a full time job for most of us, it is only half of Manick Sorcar. By night at home, in what he describes as his "mini India", Manick Sorcar is an artist, director, producer, father, and husband. Sorcar likes multi media and his broad comprehension of subject brings new meaning to the concept. He paints on peanuts; he uses seeds to create images of Gandhi, and newspaper clipping to bring Princess Diana and the Clintons to life in black and white. 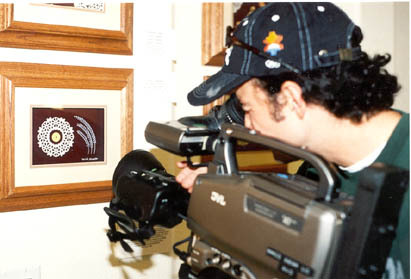 Manick Sorcar demonstrates how he does his animation in his studio. He creates award winning computer-based animations that interact with real life characters, recreating ancient Indian stories and myth for American children. His laser light stage shows which employ up to 50 people are modern spectacles that combine East and West, art and science into one amazing experience. His family are his singers and actors, his costume designers, and production coordinators. In fact, Sorcar believes his life's greatest achievement is the way he's been able to include his family in almost everything he does. A modern day Renaissance man, to use an over used and often under deserved deceleration, is probably the simplest way to describe Sorcar. There's much that can be said in two minutes but it's easy to see how the video interview assignment on Manick Sorcar could have easily run two hours. We are proud to have Manick Sorcar for our subject and thank him for giving us the time and opportunity to share his life with us."